Cue: Know What’s Next is an exciting and highly functional productivity iPhone app that could be a lifesaver and go-to for busy professionals, entrepreneurs, and families. The Cue iPhone app syncs your calendars, personal contacts, social networks, professional contacts, and online resources, then it presents the information in a cohesive, attractive, and intuitive package. There are six steps to complete registration, but they move swiftly. Since the Cue: Know What’s Next iPhone app relies heavily on the integration of your disparate social networks and large online footprint, it is reasonable to expect a lengthy registration process. You have to authorize all of the accounts you sync, and the Cue iPhone app goes above and beyond Facebook and Twitter. Many users will be satisfied with the functionality provided by the free download, but the premium services are either reasonably priced or attained by referring a friend to Cue. Free services include iOS Calendar and Contacts; Google and Google Apps Mail, Calendar, Contacts, and Docs; Yahoo Mail; AOL Mail; iCloud Mail; Facebook; LinkedIn; Twitter; and Dropbox. If you refer a friend, you and your friend can unlock Delicious, Pinboard, Reddit, and Google Reader. For $4.99 per month or $49.99 annually, you can sync Evernote, Tumblr, Yammer, Salesforce, Highrise, Basecamp, and Campfire. The quantity and quality of the syncs, as well as the reasonable price for integrating software and apps that generate income, definitely elevate the Cue: Know What’s Next iPhone app above its competition. As I hammered through the registration process, I was nervous for Cue. When you integrate and distill this high quantity of information, it has to be presented in a useful interface. Gladly, The Cue: Know What’s Next iPhone app will exceed your expectations, as it did mine. You are presented with your daily agenda in a visually intriguing and smart way. You can choose to authorize location services, so you are greeted with the day’s weather highlights at the top of the screen. Sunrise and sunset are also included in your daily agenda. For each appointment, there is a brief synopsis of the event details, as well as the event creator’s photo and source of the information. With a touch, the details are expanded, and you can send a running late text or email. You press the running late field, and touch the quantity of minutes late. You touch the mode of communication, select the recipient, and boom, it is instantly sent. 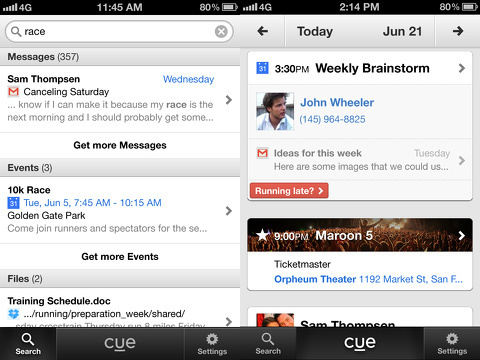 The Cue iPhone app has some special features and nuanced tools that make it appealing and useful. You can call, text, initiate FaceTime, and copy a contact with one touch. The detailed list of contact information for each contact also includes the most recent email. This eases the scrolling back and forth in your inbox to search for the right thread. With a touch, you can check out other emails as well. For each piece of information available, you can always expand it to learn more. 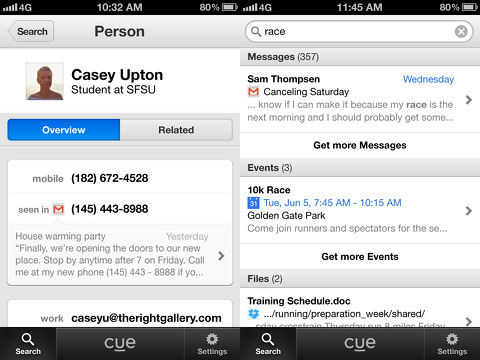 Generally, the Cue iPhone app gives you a snippet of the most recent contact and content. Then, if you need more information, you touch the appropriate field again. For each contact, you can find recent Facebook status updates, tweets, LinkedIn updates, and more by touching the “related icon.” The search feature is extremely helpful, as you simply type in the field and selections are instantly presented. If you are looking for a Salesforce contact or an article in your Google Reader, the Cue search function will help you in a snap. The Cue : Know What’s Next iPhone app synthesizes your online life and helps you stay on top of all aspects of your work, family, and personal life with beautiful interface and smart navigation. AppSafari review of Cue: Know What’s Next was written by Jenni Ward on September 26th, 2012 and categorized under App Store, Calendar, Contacts, Files, Free, Productivity, Social, Utilities. Page viewed 4654 times, 1 so far today. Need help on using these apps? Please read the Help Page.